St. George Golf Club is a municipal course operated by the City of St. George. This course has stood strong as the city has grown and new courses have been added. 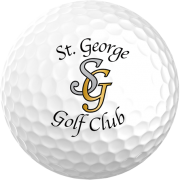 The golf course has been a part of St. George for 30+ years. It has more of a traditional feel to its layout, while maintaining the challenge of a Par 73. Those who have been coming to play golf in southern Utah for many years have most likely played it before. The appeal of St. George Golf Club has always been the favorable greens. As with most older courses, the greens are not as tricky, and putts are makeable for longer distances, even for the average player. Big greens and the area around the greens provide players area for their “less than perfect shots.” Another appeal of this course is that of two seasons. During the peak season, November through March, the golf course has the distinct look of other southwest courses where the rough has a brown look while the tees, fairways, and greens are a rich green color. The St. George Golf Club is a unique design that winds its way through the Ft. Pearce Wash. The course is one of the better layouts in the area and is perfect for those golfers who like to walk and wish to mix a little exercise with their round. The most prevalent features on the golf course are the challenging par-3s over water and the peninsula that hosts both the par-5 9th green and the par-4 18th green. Even though most golfers will have a short iron approach into these two greens, accuracy and distance control are at a premium.